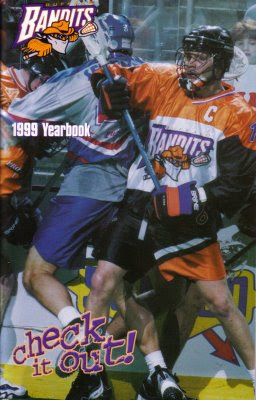 The most obvious change for the Buffalo Bandits for the 1999 season was in goal. The team had made a clean sweep at the position. In the summer draft of 1998, the Bandits had taken Matt Disher with their first round pick (seventh overall). It was the first time that Buffalo had used a first-rounder on a goalie, and the team obviously had hopes that he could make the jump to the NLL quickly. For insurance, the team signed free agent Marty O'Neill to serve as the other goalie. He was a veteran of the league, performing for Pittsburgh, Boston and Syracuse. Pat O'Toole was released to make room for O'Neill. On the field, Buffalo picked up Neil Doddridge and a first-round pick acquired from Philadelphia for Jason Luke and the Bandits' second-round pick. Syracuse also dealt Jamie Batley to Buffalo for a future pick. Not done yet, the Bandits dealt a first-round pick (fourth overall) to Baltimore in exchange for Chris Panos. Off the field, Kurt Silcott moved up to general manager and Ron Roy moved from scout to assistant coach. For the league, the Hamilton franchise had moved to Toronto and been nicknamed the Rock. The name was said to be a tribute to the city's rock-and-roll heritage. The season got off to a relatively promising start, as the Bandits beat Philadelphia, 18-17 in overtime on a night when the Wings raised their championship banner. The home opener a week later was a 22-15 thumping at the hands of Baltimore, watched by only 10,216 -- the second-smallest crowd in franchise history. That was followed by a 11-10 loss to Toronto (the Rock's first-ever game in Maple Leaf Gardens) and a thrilling 17-16 home win over Syracuse, featuring a late game-winning goal by Panos off a behind-the-head pass from Rich Kilgour. The season was interrupted at its midpoint by the league's first-ever All-Star Game, which was held in Rochester. The Canadian All-Stars beat the American All-Stars, 25-24 on an overtime goal by Ted Dowling of Rochester. Rich Kilgour of Buffalo had four goals in less than five minutes. John Tavares, Troy Cordingly, Panos and Darris Kilgour also participated. The Bandits recovered briefly from its slump to win three of the next four to move to 4-3, but that was followed by a five-game losing streak to end the season. Panos, so upset over being a healthy scratch for a Rochester game that he asked to be traded, was sent to New York as part of a three-way deal that included the Syracuse Smash. The Bandits acquired Mike Benedict and a first-rounder in 2000 from the Smash for a '99 first-rounder. Steve Kisslinger and a third-rounder came to Buffalo from the Saints. The deals didn't help Buffalo; old friend Jim Veltman scored six seconds into overtime to give the Rock a 13-12 win over the Bandits. In the midst of that skid, on March 28 Buffalo dealt an original Bandit, Darris Kilgour, to Rochester. Buffalo sent Kilgour, forward Dean Cecconi and a fourth-round pick in the 2000 entry draft to Rochester for forwards Chris Driscoll and Brent Rothfuss, as well as the Knighthawks' first- and second-round picks in the 1999 draft. Kilgour was planning to retire at the end of the season because of a bad hip, but it was still the end of an era. "We've played our entire careers together," said Rich Kilgour, the Bandits captain, about brother Darris. "Even when we were younger and wrestling kind of near the same weight, our parents made sure we got into different (weight) classes and never wrestled against each other. When he was traded it was a sad day for me, but I guess that's the nature of the beast." Wakeling was right about one thing about Darris Kilgour: "He'll make a tremendous coach some day. He's a born coach." For the record, the Bandits retired their first uniform number on March 20 before the Rochester game. Number 34 was retired in honor of Thomas Gardner, an organizer of youth lacrosse in Western New York. Back on the field, a loss in the next-to-last game to Rochester, 15-13, formally ended the team's playoff hopes. It would be the first time in team history that it missed the postseason. "It sunk in the minute I heard the final buzzer that it was all over for us," said the Bandits' Travis Kilgour, who had two goals and one assist. "I felt like I wanted to cry." A week later, Syracuse ended Buffalo's season with a 14-11 win before 3,452 -- the smallest crowd to ever watch a Bandits game in history, home or away. The Smash ended a seven-game losing streak. "I'm disappointed with the way things went; deep down I guess I'm glad it's finally over," said Tavares. "They [the Bandits] are a lot slower than they used to be and they can't play run-and-gun like they used to," the 24-year-old Mike Accursi of Syracuse said. "Other teams have so many younger guys. Some of these Buffalo guys are so old they could be my dad." The 4-8 record, including a 1-5 mark at home, was easily the worst in Bandits' history, and only a game better than Syracuse's cellar-dwelling season. John Tavares was one of the few bright spots with 33 goals and 34 assists. That was fifth in the league, and put him back on the first-team all-league squad for the seventh straight year. Batley had a respectable 31 points. In goal, Disher had a 1-5 record while O'Neill finished 3-3. "It wasn't so much the number of shots, but the quality of shots," O'Neill said. "A lot of times we saw guys standing all alone in front of us. You just can't win when you allow that." Trades didn't help, although Driscoll and Benedict ranked with the team's top scorers in the overall statistics. The team ran through 31 different players in a year to forget. Just to add to the problems, the team's average attendance dropped an all-time low of 9,638. It had been more than 12,000 in 1998 and 17,500 in 1997. The six home games produced six of the seven smallest home gates ever. Someone was sure to pay for all of this.